IN 1859, rabbits began their rampage across rural Australia, hopping out from a sheep station on the outskirts of Geelong, Victoria's second largest city where Thomas Austin had imported the little critters as targets for the local hunt club. as proficient as they could be, and the rabbits escaped the hunter's guns to go on and create havoc of unimaginable proportions. And it was in 1859 that one of the oldest football clubs in the world was formed at a location within cooee of where those 24 oversexed wascally wabbits fled. Hoops of royal blue and white, which identify the Geelong Football Club, feature on the jerseys worn by the city's elite 18 senior players. Year 2007 was their big year, winning the AFL grand-final flag – incidentally more than 40 years between flags. In the footy season the whole town talks, lives and breathes football, but the locals do like to show that they are now no longer a mob of bushies, and culture is also alive and well in Geelong. A mix of the arts and a sprinkling of culture are recent brave attempts at putting a new face on the old girl. It's working, particularly along the Eastern Beach foreshore, where dozens of eye-catching bollards have been erected providing a bit of a giggle for walkers, joggers and cyclists. The bollards tell some of the history of the city, and amazingly the years they've been on public display there's been minimal vandalism. Thankfully graffiti seems a no-no. A first class performing arts centre and an excellent art gallery are part of the current cultural scene. Sheep once roamed the vast plains which stretched from Corio Bay out into western Victoria, with Geelong becoming the major beneficiary. Whereas gold was the key mover for Ballarat and Bendigo, Geelong put its fate in the hands of graziers and indeed was the town which grew out of sheep. Amongst the earliest industrial development were wool stores established by the port with a string of woollen mills built along the Barwon River. These have now all gone and wool is no longer king. However, since the demise of wool, the buildings in the city's CBD have been transformed, some used by the local university, some about to be converted into apartments and others to house artefacts from a long gone era. Not wishing to overlook the city's involvement with wool, city fathers created the National Wool Museum in the former Dennys Lascelles wool store. It is equal to collections, of any kind, in Australia with regular exhibitions and demonstrations regularly featured. 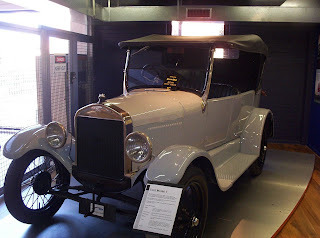 Close by, midst the former wool stores, is an exhibition which salutes the Ford Motor Company with its first class display of company produced motor vehicles, from an early Model T through to a collection from the new millennium. Ford Geelong boasts the longest company sponsorship of any sporting group in the country, having backed the local footy club since 1925, even through the lean years, of which there have been plenty. That year also saw the birth of another Geelong icon, the department chain Target. And amongst the new boys on the block are the vignerons. No less than 36 in fact, producing some of the finest wines in the country. Geelong was one of the initial wine producing areas of Australia, only to suffer the tragedies of phylloxera which wiped out the fledging industry. In the 21st century the industry is back with a vengeance. Geelong's close proximity to the Bellarine Peninsula beaches and those baches fronting the open ocean Barwon Heads, Ocean Grove, Queenscliff and on to Torquay, provide further options. The city is the gateway to the Great Ocean Road and again, more seaside settlements, such as Lorne, Port Fairy, Apollo Bay, Portland and Warrnambool. Geelong, with a population of around 250,000 is back in business. · National Wool Museum. Tel : (03) 5227 0701. · Ford Discovery Centre. Tel : (03) 5227 8700. 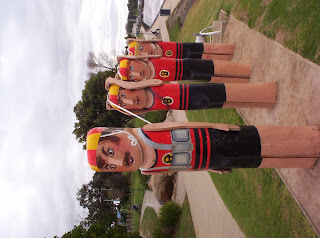 · For information on tourism and wineries contact the Geelong Otway Tourism Tel : (03) 5223 2588.
. 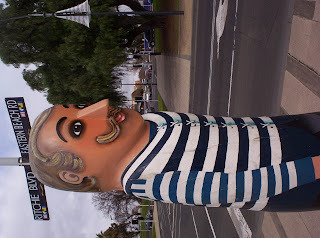 UNUSUAL bollards on Geelong's Eastern Beaches foreshore depict the city's footie history.
. AND its connections with the sea. The Vine: Win a trip for 2 to the Fuji Rock Festival: "TheVine.com.au is your information filter, shining a light on the latest and greatest news, entertainment, music and fashion buried deep inside the World Wide Web. But TheVine also provides a chance to have your say by starting a profile, blogging or contributing your own work. STA Travel, to the most original music festival in the world – Japan’s Fuji Rock Festival 2008 (My Bloody Valentine, Underworld, Primal Scream). Includes flights, accommodation, transfers and spending money. To enter, just sign up to the TheVine newsletter. Authorised under NSW permit no: LTPS/08/03027, VIC permit no: 08/1361 , ACT permit no: TP 08/01321, SA permit no: T08/1206 Terms and Conditions apply"
SeaDream Yacht Club is offering a 7-night voyage aboard the SeaDream II on August 16, 2008 that will explore the Croatian and Slovenian Coast and end in Venice. The yacht has 55 luxury bedrooms, all with unobstructed sea views, marble bathrooms, the latest entertainment systems and all mod cons. With a staff of 95, Thai Spa with 8 therapists, water sports marina, pool, Jacuzzi, a la carte restaurants inside and outside, SeaDream I & II have all the facilities of a state of the art boutique spa resort plus all the swank, the toys and the fun of being on a private motor yacht. This voyage includes visits to two new destinations, the little known sea-side village of Piran in Slovenia and the walled town of Rovinj, in Croatia. It also includes an overnight in Venice. The cruise costs US$5263 per person (that’s £2635). The itinerary: Sail from Dubrovnik to Korcula, Hvar, Split, Rab, Rovinj (all Croatia), Piran (Slovenia) and Venice (full day then overnight before disembarking). Stepping aboard the mighty Costa Serena, an 114,500 ton superliner carrying nearly 3800 passengers on luxury Mediterranean cruises, it’s difficult to imagine the long and sometimes difficult history that brought the Costa name to this point. 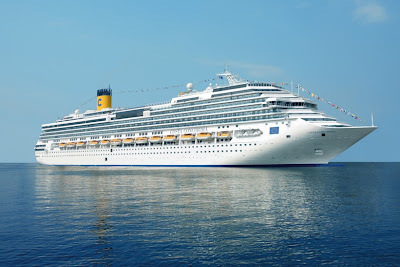 Celebrating the pre-eminent Italian cruise line’s 60th anniversary this year is something of a modest announcement because the Costa maritime connection extends back to 1854 when the family bought their own vessel to expand their olive oil and textile enterprise. The Costa fleet grew and travelled far and wide and just before the Second World War the family company owned eight ships. The fierce Mediterranean conflict all but destroyed the company, leaving them with just one vessel. However, demand placed upon the few remaining vessels was enormous and Italian shipbuilding – and Costa – were soon back in full swing with a new emphasis on passenger transport. In 1947, the cruise line ‘Linea C.’ was born with the steam ship Maria C., quickly followed by Anna C.. Luisa C. and Franca C. were added to the fleet as well as new destinations in the Americas. During the fifties, Costa developed a reputation for lavishly decorated, art nouveau style ships that were much more than mere transportation. This reputation is continued to this day with all the current vessels. Costa Serena, the newest, is styled on classic mythology. Launched amid great fanfare in Marseilles on May 19, 2007, Costa Serena is the latest in the hectic Costa build programme that will bring the fleet to 15 vessels by 2010. Following her slightly smaller sister, Costa Concordia, she will be followed by the similarly massive, Costa Luminosa in 2008. But Costa’s expansion is not restricted to just building magnificent new vessels. Giacomo Costa, the family founder, would be astonished at the growth of his vast empire. A regional office now exists in Hong Kong, where the line’s current vessel, Costa Allegra, will be reinforced by the much larger, Costa Classica, in 2009 thanks to the runaway success of the company’s Asia cruise program. To service the empire, communication, logistics, personnel and provisioning all take on a whole new scope. Even booking the thousands of new passengers and leisure cruisers requires vastly new systems. In co-operation with leading Australian-based cruise agency, ecruising.travel, enormous technological leaps have occurred in computer and on-line bookings. Independent travellers can now log on to www.ecruising.travel , check out cabin availabilities in real time and complete their booking and payment – instantly! Cruisers who prefer to use a trusted travel agent can have their agent perform the task on their behalf and leave the agency with confirmed tickets in hand in the time it takes to order and drink a cappuccino. Who said over-50s don’t like computers? ecruising.travel were recently confirmed by Internet research firm, Hitwise Australia, as receiving the highest percentage of traffic in the Travel - Destinations and Accommodation industry from Australian Internet households in the 55-plus age bracket. Many still believed the world was flat when Ferdinand Magellan set out from Spain in search of the Spice Islands of Indonesia in 1519. Three years later, with Magellan himself dead and just one ship and 18 men remaining, the first known circumnavigation of the world was completed. Such is the allure of adventure and exploration that today, nearly five hundred years later, the thrill of a journey around the world by sea is just as intoxicating and exciting as it was then. 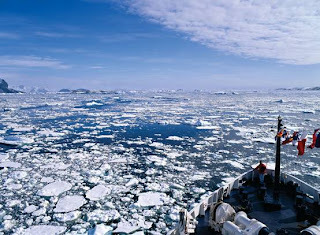 The great ocean voyages are the ones that have defined us as a race and a species. Perhaps the pinnacle of ancient maritime architecture were the enormous Chinese Ming-dynasty treasure ships of the 15th Century. These wooden leviathans dwarfed the petty craft sailed by Magellan, da Gama and even Cook with the largest of these vessels measuring some 150 metres, over five times more than Cook’s Endeavour. It is now known that vast fleets of these huge ships, and their supporting entourage, ranged throughout the Indian Ocean, stamping China’s colonial authority on lands as far away as South Africa, perhaps even further. It wasn’t until the coming of the Industrial Revolution and the widespread use of iron and steel before this mark could be surpassed. In 1858, after enormous technical and financial difficulties, the SS Great Eastern was launched. At 211 metres, she was the largest ship ever built and was designed to carry as many as 4000 passengers on transatlantic voyages. Her size was her undoing and after a series of accidents and mishaps, she was finally broken up in 1890. The 20th Century saw the great ocean liners come of age and the stories of RMS Titanic, Britannic and others are well known. But the story of Cunard’s RMS Laconia (pic left) has almost faded into insignificance. In 1923, she became the first passenger vessel to circumnavigate the globe, taking 130 days and visiting 22 ports. Built by Swan, Hunter & Wigham Richardson at Wallsend-on-Tyne, she was launched in April 1921 with a gross tonnage of 19,860 tons and a length of 183m. For a relatively small ship by today’s standards, she still managed to carry around 2200 passengers and was one of the first Cunard vessels to exploit “cruising” for pleasure’s sake. Cruising for pleasure and indeed, world cruising, is now almost commonplace. Yet the vessels undertaking today’s voyages are anything but and are virtual palaces of the sea. Without doubt, the most prestigious world cruiser is Cunard’s newest Queen, the Queen Mary 2. She preserves all that is traditional and romantic in a great ocean liner without compromising luxury or prestige. On January 2, 2009, Queen Victoria (pic right), currently Cunard’s newest vessel, embarks on her World Tour, departing Southampton for a round trip of 109 nights. Hot on her heels, Queen Mary 2, leaves Fort Lauderdale, Florida, on 13 January 2009 for a 92-night “Epic Expedition”, culminating in New York on 14 April after visiting 28 ports. Even if you don’t have the time or the inclination for such a singular undertaking, cruise sectors are available between many of the major ports, allowing you to indulge your passion for ocean cruising in shorter segments. Regular Cunard Inner Circle award winning agency, www.ecruising.travel, consistently offers the best value packages for any of the famous queens. This time next year, Queen Mary 2 returns to Sydney as part of her World Tour and presents the best opportunity to sample her many charms at affordable prices. Right now, ecruising.travel is offering an unprecedented 50 per cent off the Sydney to Singapore sector with staterooms beginning at just $4999.00. Almost unbelievably, this package includes 16 luxurious nights aboard QM2 as she sails the romantic Orient. To complete the scene, the price includes one night at the iconic Raffles Hotel and airfare home. Other sectors are available too. Imagine a 25-night Pacific Ocean crossing from Santiago to Sydney or a 49-night Southampton to Sydney via the Panama Canal. These magnificent voyages are no longer a thing of fantasy. Contact ecruising.travel on 1300 369 848 or visit www.ecruising.travel for all the details on any Cunard Queen voyage. 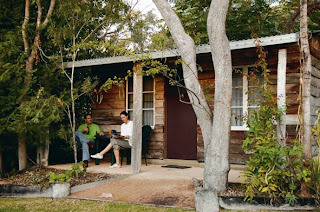 Tasmania’s newest fishing lodge is to open in June (2008). After a year of renovations the circa 1847 house has been reborn with just four luxurious bedrooms. The Priory Country Lodge is in historic of Bothwell, one hour north of Hobart. Bothwell is a gateway to the central highlands and fly fishing country. The Priory is a sister property of Hobart’s acclaimed Islington hotel. Beyond the bedrooms the Priory has a library, hunt room, dining, reading and movie rooms, a barbecue area and an outdoor infrared sauna. The manager lives off site but is the property’s host and chef. The Priory offers a refined country experience. It is for travellers who are looking to blend luxury with hunting and fishing. Priory guests will also have ready access to the oldest golf course in Australia, whisky tasting at the exclusive NANT estate, private tours and historical walks. The Priory costs $550 a night per room. All rooms can be yours for $2000 a night. Breakfast and dinner are included in the tariff. Travelling with an eco-conscience is easy in Queensland's tropical Townsville region, discovers Jessica Reid. Not only does the area boast Australia's first carbon neutral tourism business, but it is also home to many other operators that are raising the bar for 'green' getaways. Situated just 8km from Townsville, Magnetic Island (or 'Maggie' as it is affectionately known), is a must visit destination on any eco-friendly holiday to the region. The island is predominantly national park so it's no wonder there are a number of operators dedicated to preserving its natural habitat, which includes 24km of walking tracks, 23 bays and beaches and around 40km of coastline. To discover the waters around Maggie without damaging the surrounding, fragile Great Barrier Reef, there are two options. 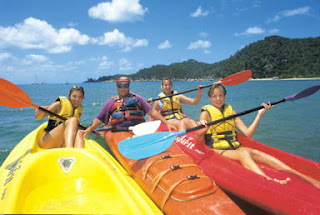 The family-run business also operates Hidden Valley Tours, a three day trip incorporating hiking, fishing, swimming and sightseeing in the Paluma and Hidden Valley regions. A highlight of the trip is a visit to the spectacular Wallaman Falls – Australia's largest single drop waterfall. All accommodation, meals and tours are included. 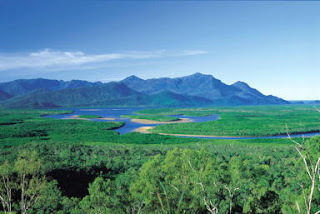 www.hiddenvalleytours.com.au. Qantas, Jetstar and Virgin Blue fly direct to Townsville from Brisbane, Cairns and Sydney. Other travel options to Townsville include the QR Tilt Train, or a Greyhound-Australia coach. It is doubtful whether the jubilant crowd in Friedrichshafen that greeted the completion of the 20-day round-the-world trip by the LZ 127 airship on 4 September 1929 saw the event as a milestone in individual freedom of travel. At that time, their joy almost certainly had more to do with the fact that the town on the banks of Lake Constance had been the birthplace of the idea for that unique journey and the first ever circuit of the Earth by an airship. The airship pioneer Hugo Eckener – it was he who had taken over the life's work of Count Ferdinand von Zeppelin – and the LZ 127 airship he piloted accomplished epoch-making achievements which created new realities in global air travel. As a result, he left a lasting mark on an era in which German pioneering spirit attained world renown in the field of technology. The Atlantic crossings of the zeppelins, the flight around the world and the journey to the Arctic in 1931 remain an unforgettable chapter in the history of aviation which established new dimensions in passenger transport. Those days saw the beginnings of a revolution in transport which was to conquer the air in years to come. The history of the airship and its flights – and in particular of the first ever round-the-world flight in 20 days – is exciting and real. The idea for such an undertaking was primarily expressed in the fictional journey of Phileas Fogg and his servant Passepartout who notionally rounded the world in 80 days by train, boat and elephant in 1872 on the pages of Jules Verne's famous novel. But what is the rescue of the princess Aouda by Fogg and his companions against the true heroics of an airship engineer? At an altitude of between 200 and 500 meters, which was the height at which airships usually flew, they had to climb down an open ladder into the engine gondola and stand watch there for at least two hours. The journey to Tokyo, for instance, lasted 101 hours, which meant the engineers changing places over 50 times, each time climbing up and down the ladder regardless of the wind and weather at the time. 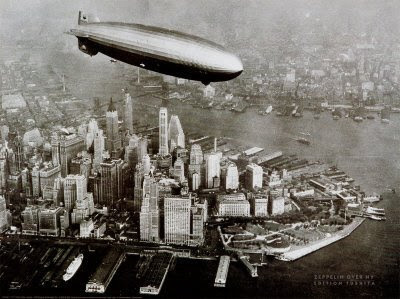 The LZ 127 airship had been named the "Graf Zeppelin" by his daughter Hella on 8 July 1928 – the day that would have been the late Count's 90th birthday. In nine years it spent a total of around 18,000 hours in the air, initially powered by five V12 Maybach VL1 engines, traveling 1,695,272 kilometers and carrying over 13,000 passengers. From August 1931 to 1937, the "Graf Zeppelin" made a total of 74 trips to South America and Rio de Janeiro as part of a regular service for passengers, freight and mail. "All that is great is educational as soon as we are aware of it", wrote Johann Wolfgang Goethe over 100 years before to his confidant and secretary, Johann Peter Eckermann. And that is particularly true of airship travel. Because the pursuit of extreme lightness of design not only placed great demands on the Zeppelin factory and its engine supplier, Maybach, but also on the close on 100 subcontractors who were challenged to achieve genuine milestones in quality and reliability by the technology of airship construction and were committed to those standards. By that time, if not before, "Made in Germany" had come to represent quality of the highest levels. And that was an achievement in which, ultimately, the zeppelins played no small part. It was the airship that was ultimately responsible for the creation of the 12-cylinder engine as cars provided no impetus for the development of large-scale engines. Thus, once again, the engine was the motor for changes in the world and in people's freedom of movement. Travel had for generations and centuries been the privilege of the powerful and high-born. When ordinary mortals set out on a journey, it was usually their last – in a simple carriage out to a field. It is no accident that the stories of great journeys in the past remain popular today. Think of the Three Kings from the East, of Marco Polo, Christopher Columbus, or Fernando Magellan, the first man to circumnavigate the Earth, of the tough seafaring Norsemen, the Vikings, who sailed as far as North America in their resilient and battle-tested rowing boats. Traveling across country, over water and through the air is one of mankind's most ancient desires, one which has triggered an infinite variety of impulses and explorations and ceaselessly occupied many great thinkers and minds. The wheel has always been the symbol of motion and the wing the symbol of freedom and escape from earthly constraints. That pursuit of mobility, with which thoughts of personal freedom were naturally associated has also always held within it a risk for life and limb. It was never without danger to venture into new elements or travel to strange countries. And perhaps that was the reason why progress in that area was made in such small steps for such a long time. It was left to men like Hugo Eckener, the obsessive airship engineer, and the equally obsessed engine designer Karl Maybach to create new directions and visionary breakthroughs in travel on land, water and in the air. On 6 July this year, it was 125 years since the birth of Karl Maybach. The airship engines, the first 12-cylinders built in Germany, undoubtedly rank among his greatest achievements. And even today, more than 40 years after his death, some of his design innovations remain fundamental and indispensable to the modern diesel engine. The story behind Costa Crociere is a story of entrepreneurial success. It was established in 1854 under the name of the founder “Giacomo Costa fu Andrea” and was so successful in the trading of fabrics and olive oil between the markets of Genoa and Sardinia that it soon set up a fleet of ships transporting goods all over the world; and by the end of the last century its goods reached far-away shores such as Australia, where the constant flow of Italian emigrants generated a market for national foodstuffs. Costa was specialized in the purchase of raw olive oil in the Mediterranean countries for export overseas. In the first decade of the twentieth century Costa was in a position to enter the naval field: in 1924 the small steamship Ravenna was used to supply raw materials to markets in the western Mediterranean and in 1928 the Langano was added to the fleet. The thirties saw the start of the tradition of naming the ships after members of the family: Federico (’31), Eugenio and Enrico (’34), Antonietta, Beatrice and Giacomo (’35). At the start of the Second World War the fleet boasted eight ships for a total of 27,534 tons. Only the Langano survived the war, but Costa took up its shipbuilding activities again, building and buying other ships for coastal trading. 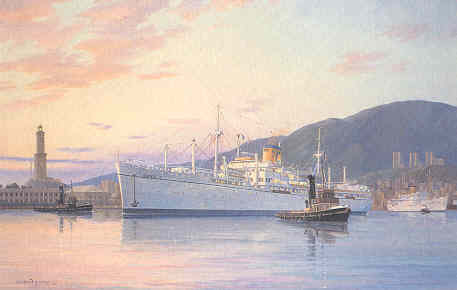 The destruction of the Italian passenger fleet, the growing demand for passenger traffic, the economic crisis and the flood of emigrants across the ocean drew the attention of the far-sighted Costa family, and in 1947 they inaugurated a new passenger service, first class - equipped with air conditioning - and second class. It was the steam ship Maria C. that began to meet the first demand for passenger transport, quickly followed by the Anna C. (pic right), the first Italian transatlantic to cross the western Atlantic after the war. In 1947 Giacomo Costa fu Andrea became “Linea C.”. The commercial services towards North America were inaugurated in 1948 with the art nouveau style ship Maria C., soon flanked by the Luisa C. In 1953 the Franca C. opened new routes towards Venezuela and the Antilles. The launching of luxurious, new ships, equipped with air conditioning in first and second class and with comfortable and elegant rooms, impeccable service offering hospitality, comfort and the best of traditional Mediterranean cuisine denoted the unmistakable Italian style. A style which reached its zenith in the fittings, the furnishings and the architectural styles. Even Giò Ponti, director of the magazine Domus, turned his attention to naval matters and mentioned the architectural and decorative aspects of the Costa fleet. A tradition which continues today. 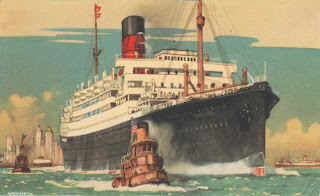 The ships were divided into three classes (first, second and tourist), the entertainment and the attractions for the passengers, whether adults or children, are still a characteristic of the Costa fleet which has been continuously growing since the fifties. Bianca C., Enrico C., Andrea C.(pic left), Flavia, Fulvia and Carla C. were refurbished in the fifties to offer something more than a mere means of transport. Until the inauguration of the first ship commissioned by Costa from the Genoa shipyard Ansaldo.The Federico Costa, still divided into three classes, was equipped with restaurants and unusually shaped swimming pools. 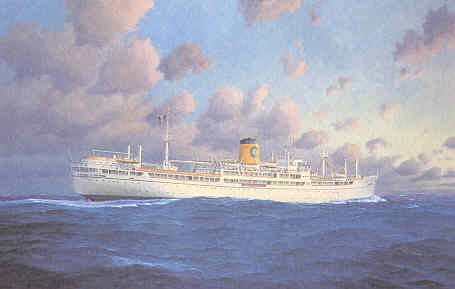 In 1959 Costa realized the first ship in the world completely dedicated to pleasure cruises of 7 and 14 days in the United States and the Caribbean: the Franca C., flanked in the winter months by the Anna Costa, which proposed 3 or 4-day mini cruises starting from Port Everglades to Bahamas. The early 1960’s were triumphal and the by then customary routes in South America or the Caribbean were joined by cruises in the Mediterranean, the Black Sea, in Brazil, Uruguay and Argentina, right down to the Straits of Magellan and the Antarctic. The success of the Linea C was such that in 1964 the Company ordered the construction of the Eugenio C. Immediately christened “the ship of the future” thanks to its fittings and its elegance. A ship no longer formally divided into three classes, but conceived as a single deck, onto which all the lounges face. A clear indication that the Eugenio C. (pic left) would be totally dedicated to cruising, the choice for the future of Costa Armatori. In 1968 the first ship exclusively used by passengers, the Franca C. inaugurated the formula of “fly and sail”, destined to revolutionize the conception of holidays and offering holiday-makers with little time to spare the opportunity to take short cruises in distant parts of the world. Once again the evolution of tourism has proved Costa right, during the seventies the fleet was increased with ships leased or bought outright. Particularly noteworthy were the splendid twins Daphne and Danae, who sailed the Mediterranean in the summer and the Caribbean in winter, with trips to Alaska, Scandinavia, South America, Africa and the Far East. 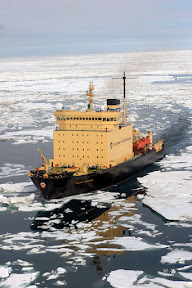 During the eighties the idea of the ship as a floating hotel became increasing accepted. The ships became holiday resorts, the division between the classes disappeared completely, the cabins tended to become more uniform and the places of entertainment multiplied: bars, theatres, casino, discotheque. Everything was available to everyone. Building on the foundations the cruising industry in general and Costa Armatori in particular prepared for the great leap in quality represented by the founding of Costa Crociere in 1986. 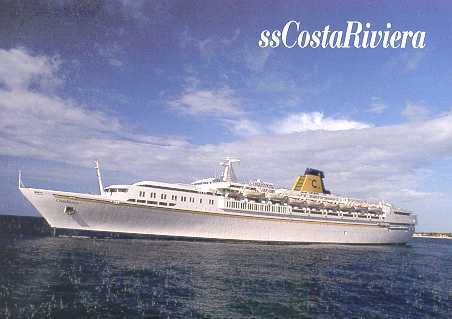 But once again, the ships are the stars of the enormous development of the company, from the Costa Riviera, completely refurbished in 1985 and in 1998, to the ships built in the nineties; the Costa Marina, the Costa Allegra, the Costa Classica, the Costa Romantica and in 1996, the splendid Costa Victoria. Not to mention the Mermoz and the Costa Playa (later sold), purchased in 1993 when Paquet Cruises of the French group Chargeurs & Accor was dismantled. 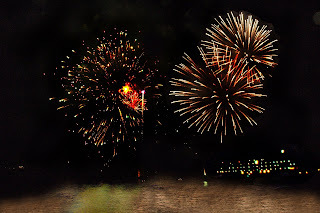 In 1997 the company was purchased by the American firm Carnival (50%) and the English firm Airtours (50%), increasing the investment capacity of the Genoese company while maintaining its identity as an Italian company. The growth of Costa Crociere has never stopped. In November 1999 the technical launching of the Costa Atlantica, the new flagship christened in the wonderful setting of Riva ai Sette Martiri in Venice in July of 2000, opens a new page in the company history. The Italian flag returns, after about ten years, to wave on the yards of Costa’s ships and the company introduces a new concept never seen before. With its dimensions, which makes her the biggest passenger ship in the history of Italian maritime, the Costa Atlantica (pic left) opens the path to the new company development guidelines: comfort cabins like grand hotel rooms, most of with a balcony, a series of unforgettable ambiences and atmospheres which will attract new passengers to the cruise experience. 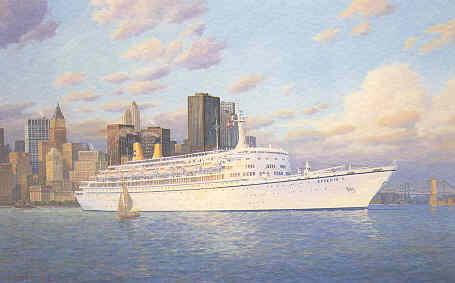 In August 2000, Costa Crociere announced the order of the Atlantica’s twin ship, the Costa Mediterranea. At the end of September 2000, The Carnival Corporation, having purchased all shares from Airtours, became the sole shareholder of Costa Crociere, Genoa. This change gives a further incentive to the Development Program of Costa and confirmed a new deal with Fincantieri in Genoa Sestri Ponente to build two new 102,600 ton cruise ships and with a total passenger capacity of 3,470, the Costa Fortuna and the Costa Magica, for delivery at the end of 2003 and 2004. The expansion of the company has been possible by the addition in June 2001 of another ship, the Costa Tropicale, originally belonging to Carnival Cruise Lines, which was completely refurbished in the style of other Costa ships. Moreover, in March 2001, Costa announced the purchase of the ship Westerdam from the American sister company Holland America Line, which entered in service at the end of April 2002 under the name of Costa Europa. 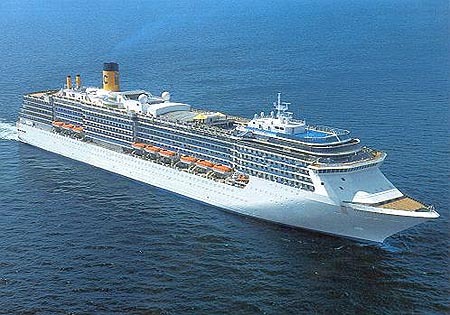 The Costa Mediterranea, twin sister of the Costa Atlantica, was delivered to the company on May 22, 2003. 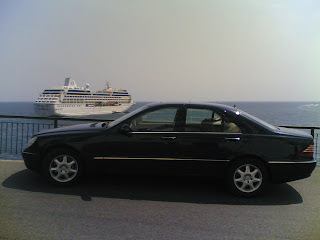 November 14, 2003 marked the arrival of the Costa Fortuna. The Palacrociere, Savona's new cruise terminal, jointly financed and managed by the company, was opened on November 24, 2003. In January 2004 Costa Crociere announced the signing of a letter of intention with Fincantieri for the construction in Sestri Ponente of another new ship with a tonnage of 114,500 tons and with a total passenger capacity of 3,780, the Costa Concordia, which will go into service in the summer of 2006. 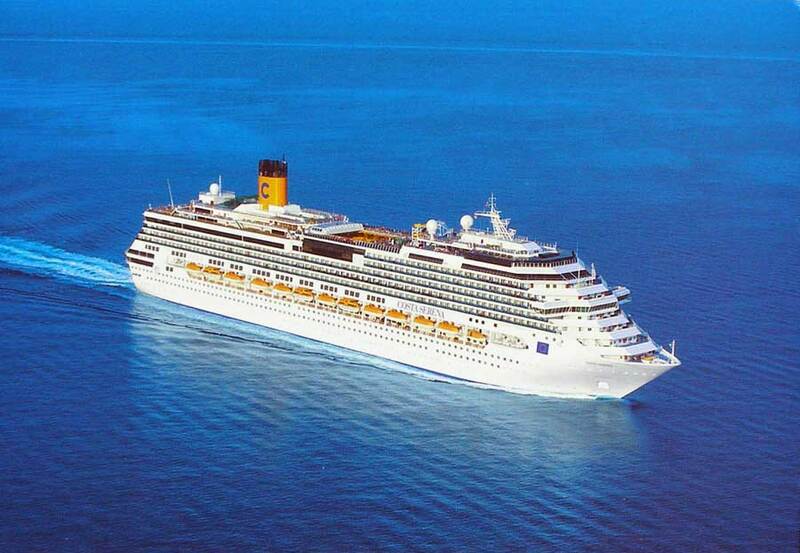 On October 29th, 2004 the Costa Magica, twin sister of the Costa Fortuna, was delivered. In the same year Costa Crociere S.p.A. acquired the brand AIDA Cruises, the cruise leader in Germany. In January 2005 Costa Crociere announces the order to Fincantieri for a twin sister ship of the Costa Concordia, the Costa Serena (pic above left), which will be ready in spring 2007, and transfer of the Costa Tropicale to the P&O Australia brand in October 2005. The growth programme of the fleet continued in December 2005 with the announcement of a third sister ship of the Costa Concordia and of the Costa Serena, named the Costa Pacifica, to be delivered by Spring 2009. In 2006 Costa announces its expansion in Asia Pacific and in Dubai, confirming its international character. In June 2006 Costa placed an order with Fincantieri for two new 92,700-ton ships to be built at the Fincantieri Yard in Marghera, the Costa Luminosa (pic right) and its sister ship, which will come into service in Spring 2009 and 2010. In July 2006, the Costa Concordia came into service and in February 2007, Costa announced new exclusive itineraries from Mauritius to the Seychelles, Kenya and Madagascar. In April 2007, the new “Palacruceros” terminal, owned and financed by the company, was inaugurated and in May 2007, the Costa Serena was delivered. On July 17, Costa Crociere reached a historical record in Europe: 1,000,000 Guests booked in only one year. The announced joint venture between Costa Crociere S.p.A. and Orizonia Corporaciòn was approved for the creation of the brand “Iberocruceros”, belonging to the Costa group and operating in the Spanish market. In October the order to Fincantieri for 2 further ships of the “Concordia” class was announced. Costa thus enters the third millennium with an expansion program that will enable it to maintain its European leadership in a fast growing market. The fleet that will fly the Italian merchant marine flag in years to come will be even more modern, offering Italian-style hospitality and an unparalleled showcase of Italy's artistic trends. Costa Crociere has been part of Carnival Corporation & plc, the world leader in the cruise sector, since April 2003. AIDA Cruises, the leading brand in the German speaking market, with four ships in service and five on order, and Iberocruceros, operating in the Spanish market, with two ships in service and one on order, both belong to the Costa Crociere S.p.A. Group, completing a total of 18 ships in service and 11 on order. All ships fly the Italian flag. SO you want to hire a train so you and your mates can see Italy in style. little Italian bay below as you celebrate the big day. you to the airport in the style to which you've become accustomed. magician plucks rabbit from a hat. a side trip to a dozen of Italy's most famous cities and sights? Or simply settling down to a white-glove Pasta, Pizza and Wine party. the travel industry in Naples as well. and at times the outlandish, blossomed. To Francesca there's no such word as No. nice to mark the Big Night. SeaDream II during his week-long Mediterranean charter. pool deck as his friends came aboard to join him for his special week. brought aboard purely for these evening rituals. of the ordinary they may seem," she says. "We strive to turn every traveller's dream into a reality," Francesca says. celebrate his 50th birthday with a hundred family and mates. 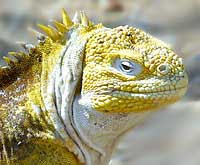 Ecoventura is the pacesetter in responsible tourism to the Galapagos Islands. 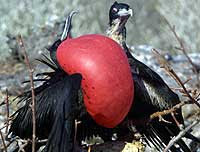 Through its core commitment to the ongoing sustainability of this fragile and at-threat ecosystem, Ecoventura (www.ecoventura.com) is a case study for communities and regions seeking to discourage the negative effects of irresponsible tourism. We invite our media friends to take a close look at this one small company that is “walking the talk” of sustainable tourism. Through an initiative of President and Owner Santiago Dunn, Ecoventura has spent upwards of $500,000 since 1999 to refurbish its fleet of touring vessels in order to meet its own stringent ecology-minded standards. It has pledged to collect through client donations and its own infusions $80,000 per year over the next three years for the Galapagos Marine Biodiversity Fund which targets environmental education and marine conservation by strengthening the local communities’ ability to manage natural resources. On one level this is self-serving; if the fragile ecosystems of the Galapagos Islands are irreversibly damaged by tourism and visits are drastically reduced or altogether banned, Ecoventura is out of business. On the highest level, this small company is doing its part to raise the consciousness of travelers and how collective footprints can either be a disaster or a positive effect. • One of the first recipients (in 2000) of SmartVoyager, a voluntary environmental program developed by Corporacion y Desarollo from Ecuador and The Rainforest Alliance from New York. This program gives a “green seal of approval” to tour boats that comply with requirements to tread lightly on the area’s fragile ecosystem. • The first (in 2006) Carbon Neutral operation in the Galapagos Islands when it chose to completely offset carbon emissions from the company’s four yachts, offices and operations (including business travel). Emissions are now being offset through a portfolio of projects administered by NativeEnergy. • The first fleet in the Galapagos (2007) to install TRABOLD oil filter systems on all four yachts to reduce fuel consumption, oil lubricants (by 90 percent) and reduce gas emission. 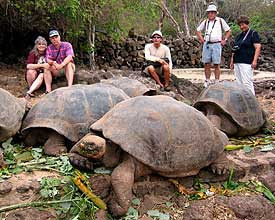 • The first company in the region (2006) to implement a program whereby its guests can donate to a new fund administered by the World Wildlife Fund (www.wwf.org) in support of the Galapagos National Park. Ecoventura partnered with the WWF to create the Galapagos Marine Biodiversity Fund (GMBF) which targets environmental education and marine conservation by strengthening the local communities’ ability to manage natural resources. Ecoventura is a family-owned company based in Guayaquil, Ecuador with sales offices in Quito and Miami. 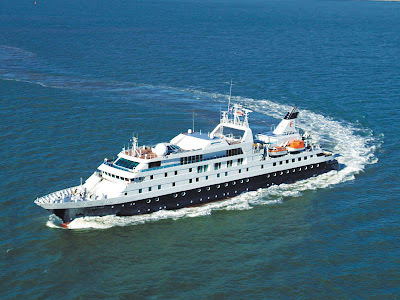 The cruise company transports 3,000 passengers annually aboard a fleet of three expedition vessels; identical, superior first-class 20-passenger motor yachts with 10 double cabins. The company also operates the Sky Dancer, a 16-passenger dedicated dive live-aboard offering 7-night weekly itineraries visiting the northern islands of Wolf and Darwin. The marine reserve surrounding these two remote Islands supports some of the planet’s most unique biodiversity and is one of the world’s premier diving areas. However, it has also been identified as the most threatened due to continued presence of industrial fishing boats. 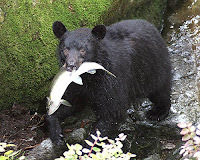 To date, park statistics demonstrate the highest number of fishing violations have occurred in this area. Hammerhead and other shark species around the world are being harvested primarily for their fins and the Galapagos Marine Reserve remains one of the last regions where these creatures can be seen gathered by the hundreds. It is vital to establish a local and permanent surveillance and patrolling platform that will deter illegal fishing vessels from entering these waters. Because the park lacks inadequate funding, trained personnel and equipment, it is challenged to prevent illegal fishing by industrial scale boats. In response, the GMBF supports the maintenance of park patrol boats while also helping to make current small-scale fishing practices more efficient. Funds are also allocated to refurbish and maintain a speed boat that patrols the Bolivar channel between the western Islands of Fernandina and Isabela. These islands are visited by passengers on Ecoventura programs. Funds from GMBF have also been allocated to benefit families of local fishermen by development of a microenterprise for the fisherman’s wives to manage. This will provide an alternate means of income and also set an example to create other tourism related businesses and reduce the need to fish. Forget the onboard spas and saunas; Captain Cook Cruises is letting your partner keep you extra warm this winter with partners cruising half price on all three, four and seven night Murray River cruises from 01 June - 31st August, 2008. This amazing offer is valid for sale until 31st August 2008. With plenty of water in the Murray River there is no better way to explore the big river gorges, the bio-diverse Murray wetlands, the unique flora and fauna of the outback and the rich legacy of old riverside ports, this winter than on the romantic paddle-wheeler PS Murray Princess.